Welcome to Hot Off The Mat’s next installment of Interesting Reads, where I periodically recommend books on yoga and meditation. If you have book suggestions, please let me know. Enjoy! 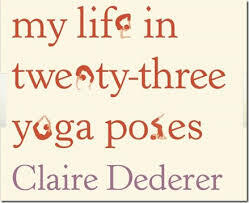 Knowing how much I love yoga, my friend recently suggested I read Poser: My Life in Twenty-tree Yoga Poses by Claire Dederer. Poser is the story of Claire, who after the birth of her first child, is searching for answers. How can she be the perfect mom, while continuing to be a good wife, friend, daughter and freelance writer all at the same time? To find sanity in her daily life, she turns to yoga. Claire’s journey to find the right style of yoga for her takes her through some less than ideal studios and teachers, but also through some great ones. Through her exploration of yoga, she learns about herself, works through deep-seated insecurities, and finds the courage to stay true to herself when making important life choices. It was an interesting read. I will warn you that it takes a few chapters to warm to Claire, but if you stick with it through those, you will be rewarded. My favorite parts of the book involved her misadventures when trying various yoga studios and styles, and the interesting cadre of yoga teachers that she experienced. As a Bikram yoga regular, I sometimes forget how much variety there can be class by class and studio by studio, since all Bikram classes are essentially the same anywhere in the world. I also realized how lucky I am to have found a studio, great teachers, and a style of yoga that resonated with me right off the bat. This was not so easy for Claire, and I imagine it is tough for others as well. What I liked most about the book is how the yoga helps Claire to find her true self and to make peace with the challenges she faces in her life. It helps her to acknowledge and resolve certain lingering issues in her relationships with others and to have the confidence to trust herself, rather than rely on “common wisdom” as relates to parenting, family relationships, and the ups and downs of a marriage. It is also fun to see how she uses the yoga postures as metaphors for different life events and challenges. My favorite quote from the book is at the start of the prologue, “Taking up yoga in the middle of your life is like having someone hand you a dossier about yourself. A dossier full of information you’re not really sure you want.” How true is that! But in the end, I believe having that dossier makes it possible to know yourself better, and by doing so, lead a more fulfilling and happy life. If you have the time, check out the book. It is a quick read and the descriptions of her yoga practice are funny and relatable. And just to be clear, nobody asked me or paid me to review this book. I just enjoyed it and wanted to share. Fellow yogis, what yoga books are you reading now? You can also find Hot Off the Mat on Facebook and Twitter? ← How Should We Breathe In Savasna? I remember reading that book, and, like you, recall that it took a few chapters to warm up to Claire’s story. I thought to myself as I read that I wanted more from her story and realized that had more to do with the growth going on in my life–that I needed to spend more time writing my story.